Ghana President, Professor John Evans Atta Mills was full of thanks to Nigeria for their prayers and support, which he said ensured the Black Satellites won Africa's first title in the U-20 category following a pulsating penalty shoot-out victory over Brazil yesterday, which threw the whole of Ghana into frenzy. 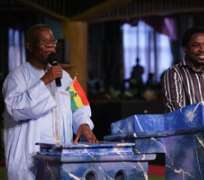 President Mills revealed that he had contacted Prophet TB Joshua to intensify prayers for the team after he was alerted about how several predictions of The Synagogue General Overseer on Super Eagles' World Cup Qualifiers came to pass lately. Our source revealed that the Ghana U-20 coach, Sellas Tetteh had also made a nocturnal visit to Nigeria to meet the prophet, and was told that Ghana will win the match on penalties, provided the coach allow Andre Dede Ayew to take the first kick – which eventually came to pass. “It gives me great joy to rejoice with Ghana and indeed Africa for this win. I was on line to Nigeria asking for prayers from the man of God to help our team, and I was assured that we will win on penalties. May God bless Nigeria for their support,” he said. “I was told what the man of God said; which revealed that we will win on penalties – and thank God it has come to pass,” the president revealed. The president said that the win has brought more joy to Ghanaians all over the world and indeed Africans, who had waited for 32 years to bring the FIFA U-20 World Cup trophy to Africa. It would be recalled that Prophet TB Joshua had predicted all the matches involving Super Eagles correctly, and it remains to be seen what awaits Nigeria's Golden Eaglets at the forthcoming U-17 World Cup.